The latest Humble Bundle is an absolute killer of a deal for fans of excellent games and anyone with any modicum of taste at all actually. As with all Humble Bundles you can choose to pay whatever you want for the 3 base games which are Bioshock, The Darkness 2 and the bad XCOM. 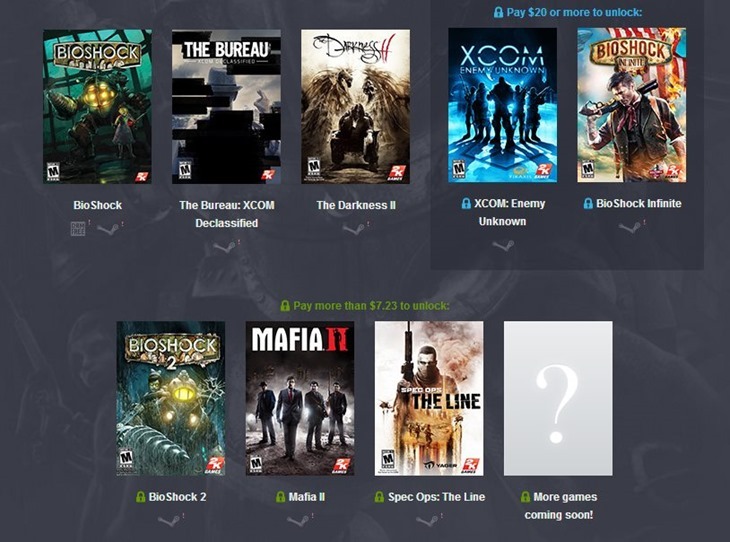 Or pay above average (currently $7.23) to throw in Bioshock 2, Spec Ops, Mafia 2 and the mystery game. But paying the full price of $20 to get Bioshock Infinite and the good XCOM game thrown in with the other 7 is an absolute no brainer. And what makes it great is that a share of the money goes to charity with Action Against Hunger and The Red Cross benefiting this time. So unless you’ve played every single one of those games I can’t see any logical reason not to head over to the Humble Bundle page and part with some cash.